Do you have any error coins with repunched mint marks? I’ve got a 1957 repunched mintmark wheat penny, and it’s one of my favorite old error pennies. While repunched mint marks (or RPMs) are perhaps most commonly found on old Lincoln wheat pennies, these errors can be found on coins from all denominations. Here’s a list of the top 50 Lincoln pennies with repunched mint marks. A mintmark is a tiny letter (or letters) on a coin that indicate which United States Mint facility made that coin. Here’s everything you could possibly want to know about U.S. mint marks. What Is A Repunched Mintmark? Until the 1990s, United States Mint officials individually stamped the mintmark onto working coin dies — instead of the master die, as is done these days. In most cases, the 2 mint mark impressions are overlapping or touching in some way. In rare cases, the mint marks are in 2 separate, distinct locations. Wondering why a mintmark would have been punched twice on a coin? The mintmark punch wasn’t held perfectly vertical to the die, causing the punch to skip and leave another impression. A mintmark that wasn’t positioned correctly was partially removed and was replaced with another mintmarked punched in its place. The letter punch was struck onto the die twice to help enhance mintmark detail, but the second blow wasn’t in precisely the same location as the first. The punch ricocheted off the surface of the die, making a second, lighter impression. The secondary mintmark was punched to correct a mispositioned first punch. While error coins with repunched mintmarks may exhibit the mintmark twice on the coin, these are NOT doubled die coins. Because a doubled die specifically refers to a variety created when the hub (which imparts a design on the die) makes 2 impressions on the die at slightly different angles. So, doubled dies and repunched mintmarks are not the same kind of error coins. Some folks may think repunched mintmarks are synonymous with overmintmarks (or OMMs). A repunched mintmark error coin exhibits the same mintmark twice. This could be, say, a “D” or “S” — struck twice, and in 2 slightly different locations or angles. An over mintmark occurs when one mintmark is struck over a different mintmark from another mint. This is exhibited in an error — such as a “D” mintmark from Denver over an “S” mintmark from San Francisco. 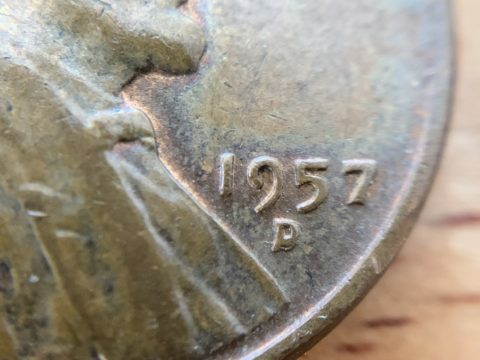 Some coin enthusiasts also recognize dual mintmarks (or DMMs). A dual mintmark variety is an error coin in which 2 different mint marks from 2 different mints are physically separated from each other on the coin. Repunched mintmarks, over mintmarks, and dual mintmarks are all scarce error coins. The most common of these are repunched mintmarks, followed by over mintmarks, and then dual mintmarks. In most cases, dual mint marks are among the scarcest of these varieties. If you’re looking closely enough through a lot of old coins, you’ll probably find some coins with repunched mint marks. And you can certainly find many coins with repunched mintmarks in your everyday pocket change — but you’ve got to look carefully. A repunched mintmark isn’t always obvious at first glance. However, if you use a magnifying glass with 5x or 10x power and carefully inspect the mint marks on your coins, you’re bound to eventually find those that have been punched incorrectly… or more than once! One of the keys to looking for repunched mint marks on coins is to check around the edges and inside loops of the mint marks for any signs of raised metal that wouldn’t ordinarily be there. And don’t forget to also look for the tiniest of variations in the mintmark. There are plenty to be found!… In fact, there are more than 1,500 attributed and cataloged repunched mintmarks among Lincoln cents alone. The average novice taking a look at any of those Lincoln cents with the naked eye would be hard-pressed to identify where and how each variety is a repunched mintmark — because most repunched mintmark varieties exhibit relatively minor differences from “regular” coins. That’s why it’s important to really know the series you’re most interested in — be it Lincoln pennies, Morgan dollars, or something else. Most coin series hold a plethora of exciting varieties, but you’ve got to know what to look for. The same holds true for coins with mintmark errors. You’ve got to understand what a repunched mintmark looks like and begin looking at different examples of varieties to really know how to collect these cool error coins. First you’ve got to be looking straight on at the obverse (heads side) or reverse (tails side) of the coin — with the design oriented upright. If the repunched (secondary) mintmark is above the primary mintmark, its position is north. If the secondary mintmark is below the primary mintmark, then its position is south. A secondary mintmark to the right of the primary mintmark is in an east position. When the secondary mintmark is to the left of the primary mintmark, it’s in a west position. NOTE: Repunched mintmark specialists also use terms such as northwest, northeast, southwest, and southeast to describe secondary mint marks that are shifted to a corner of the primary mintmark’s location. It’s pretty difficult to peg down values for repunched mintmark coins. You see, “regular” coins such as normal Lincoln pennies, Kennedy half dollars, and silver dollars are regularly traded — and the values of these coins are relatively easy to determine because market data is frequently updated and widely shared. But repunched mintmark coin values are error coins that represent a very small number of the total coins traded and sold. Many repunched mintmarks are relatively common, while others are scarcer. As you’d guess, the values for repunched mintmark error coins listed above are merely representative general figures. Your coins with certain mintmark errors may be worth more or less — depending on the condition of the coin and other factors. Generally speaking, the more dramatic the repunched mintmark, or the greater separation between the primary and secondary mint marks, the more your error coin is worth.